A study by Eawag and Zurich University researchers using a new imaging method has revealed that, surprisingly, cocaine accumulates in the eyes of zebrafish. The findings indicate that chemicals — especially psychoactive drugs — need to be assessed quite differently with waterborne exposure than, for example, when pharmaceutical substances are tested in mice. In particular, the uptake mechanisms and effects of cocaine in fish cannot simply be transferred to mammals or humans. 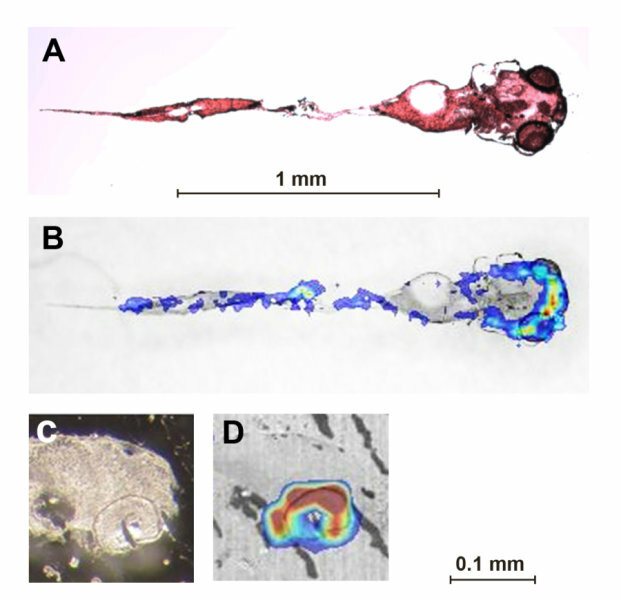 Cocaine distribution in five-day-old zebrafish larvae exposed to 50 µM cocaine for eight hours. A) Optical image of stained coronal tissue section, B) overlay of A with MALDI image. C) and D) Saggital section of head with eye (bottom right). In the MALDI images, blue = low concentrations, yellow-red = high concentrations of cocaine. By far the highest concentrations were found in the eyes. Zebrafish larvae a few days old are frequently used in toxicology tests — e.g. to study the behavioural effects of drugs — in order to avoid experiments in mammals. Taking the example of cocaine, researchers at Eawag, together with colleagues at Zurich University, have now shown that the uptake and distribution patterns and the effects of the drug in zebrafish differ in many ways from those in mammals. In their study, a complex imaging method (MALDI MSI[i]) was used for the first time to determine where cocaine accumulates in zebrafish. After being exposed to a defined concentration of the drug for eight hours, the larvae were euthanized and frozen. Tissue samples a few micrometres thick were then imaged by laser scanning. The images show that the greatest accumulation of cocaine is to be found, not in the brain, but in the eyes, where concentrations over 1500 mg/kg were measured — compared to around 300-400 mg/kg in the trunk and brain. This finding is striking: while increased concentrations have been observed in the head region in other fish studies, the highest concentrations were assumed (without more precise measurements) to occur in the brain. In addition, compared to mammals, these levels are very high: in mice, concentrations 100 times lower are generally lethal, and in humans, 1000 times lower. Environmental toxicologist Kristin Schirmer, who co-led the project with Thomas Kraemer of the Zurich Institute of Forensic Medicine, cannot yet fully explain their findings. It is, however, clear that cocaine is taken up rapidly and continuously by zebrafish larvae, which at this early stage have not yet a fully developed blood-brain barrier. Schirmer and her team found other major differences between the fish tests and the patterns observed in mammals: while cocaine has a stimulatory action and causes hyperactivity in mammals, it suppresses locomotor activity in zebrafish. The effects of cocaine on peripheral nerves — due to rapid uptake through the skin and gills — thus appear to override any potential effects on the brain. In contrast to mammals, the elimination process is delayed as a result of the accumulation of cocaine in zebrafish eyes: 50% of the cocaine was eliminated after eight hours in clean water, and 30% still remained after 48 hours. Web Source: EAWAG: Swiss Federal Institute of Aquatic Science and Technology.